Whenever I see a “Where I’ve Been” post on social media, I am always way too giddy to update my own map. Ilana has been to: Anguilla, Argentina, Aruba, Australia, Belgium, Bolivia, Brazil, Canada, Colombia, Croatia, Curacao, Czech Republic, Denmark, France, French Polynesia, Germany, Greece, Haiti, Hungary, Indonesia, Ireland, Israel, Italy, Jamaica, Mexico, Monaco, Morocco, Netherlands, New Zealand, Panama, Peru, Puerto Rico, Saint Martin, Sint Maarten, Spain, Sweden, Switzerland, Thailand, U.S. Virgin Islands, United Kingdom, United States, Uruguay, Vatican, Vietnam. 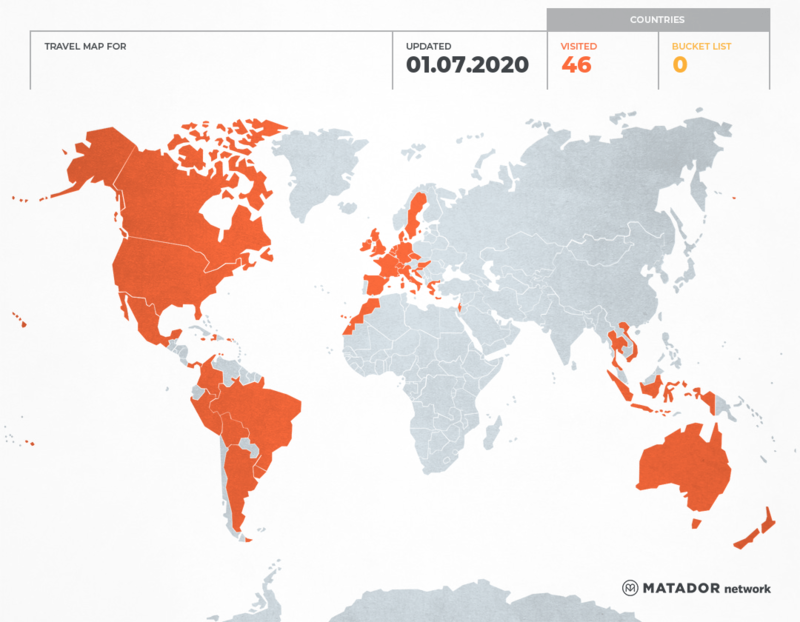 Get your own travel map from Matador Network. I love thinking back on all of the adventures I’ve gone on so far, but it might be even more fun to think about all of the trips I’d like to take in the future. Fortunately, our next one starts tomorrow night and I couldn’t be more excited. Stay tuned for posts about my triumphant return to the land down under.